This is a story of contrasts. When we first meet the Leong family, who live and work in San Francisco’s Chinatown, there is an overwhelming sense of greyness, of a fog having descended upon the family, of which they cannot see out of. And soon, we learn why. Leila’s middle sister Ona had killed herself. “Like that, we all just snapped apart. For me, it was as if time broke down: Before and After Ona Jumped. I didn’t want anything to be the same. I wanted a new life, as if to say that person then, that person that wasn’t able to save Ona, that person was not me. All of us took that trip, but we came back to ourselves, to our old ways. I had to believe that it’d been Ona’s choice. Leila is the daughter who is still there. Her youngest sister, Nina, fled to New York, in the After of things. Leila is the one who has to pull the family together. Her stepfather Leon, a merchant seaman, a hoarder who tries to fix broken things and invent things from his collected junk. He’s convinced that the family’s bad luck stems from the bones of Grandpa Leong, which remained in the US instead of being sent back to China. Her mother, a hardworking seamstress, blamed it on the bad choices she had made. She blamed the family’s bad luck on herself. Ng tells the story of the Leong family in a backwards motion. It is not entirely discernible at first as there are no dates, no chapter headings that warn you that this is told in reverse. But as I understood what she was doing, I really began to admire the story and its writer. For Ng’s backstroke through the Leong family’s story brings with a true understanding of what grief can do to a family. The grief of losing a daughter, a sister, has aged them all, has ripped the colour from their lives and left them a dull grey. It is a story that is gently told yet is emotionally powerful and brave. And always, always, it is a story of San Francisco, from its foghorn to its highways, its Chinese immigrants and their struggles. 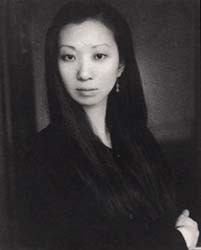 She is a first-generation Chinese American author whose debut novel Bone told the story of three Chinese American daughters growing up in her real childhood hometown of San Francisco Chinatown. Her work has received support from the American Academy of Arts & Letters’ Rome Prize, the Lila Wallace Reader’s Digest Writers’ Award, the National Endowment for the Arts, the Lannan Foundation, and The Radcliffe Institute. She held residencies at Yaddo, McDowell, and the Djerassi Foundation. She is the daughter of seamstress and a laborer, who immigrated from Guangzhou, China. She attended the University of California-Berkeley, and received her M.F.A. at Columbia University. Ng has supported herself by working as a waitress and at other temporary jobs. Her short stories have appeared in the American Voice, Calys, City Lights Review, Crescent Review, Harper’s. She currently teaches at UC Berkeley. Next Post → It’s Monday and I had a wonderful birthday weekend! I love books that are set in the area where I live! Were there San Francisco places in the book that you recognized?? Oh definitely! And because she and her boyfriend drive it includes places in the SF Bay Area that I am more familiar with – we don’t go into the city very often so I’m less familiar with places there really! I was just thinking about how it reminded me a little of Everything I Never Told You by Celeste Ng. Have you read that?